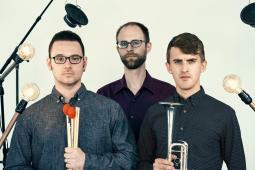 SPLICE Ensemble is a trumpet, piano, and percussion trio focussed on cultivating a canon of the most important works composed for instruments and electronics. Called a “sonic foodfight” by Jazz Weekly, SPLICE Ensemble works with composers and performers on performance practice techniques for collaboration and integrating electronics into a traditional performance space. The resident ensemble of both SPLICE Institute and SPLICE Festival, SPLICE Ensemble has been a featured ensemble at M Woods in Beijing, SEAMUS, the Electroacoustic Barn Dance, SCI National, Electronic Music Midwest, and New Music Detroit’s Strange Beautiful Music 10. They have recorded on both the SEAMUS and Parma Labels. SPLICE Ensemble is a 2018 Classical Commissioning grantee. We will commission a new work by Caroline Louise Miller!